Call me addicted. Call me obsessive! Yes! I had to do this book, too! I LOVE these puzzles! I'll probably repeat what I have said about some of these other puzzlebook quizzes, but for the one person who has not seen the other reviews, they need to know all this information. 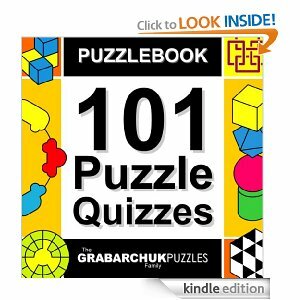 I did a review on the Easter Puzzle Quizzes and the 100 Puzzle Quizzes by the Grabarchuk Puzzles Family and I LOVE THEM! I cannot get enough of these puzzle quiz books, as if you can't tell! So, I received this book, the 101 Puzzle Quizzes by the Grabarchuk Puzzle Family, and this is Volume Two! Thank you! These puzzles are so much FUN! You really cannot get enough of them! They are professionally made and look it as well. It might sound funny to say this, but they are beautiful! They start at the beginner's level and get harder as you go on, all the way up to expert level. These puzzles are visual puzzles. You have to look at them and try to figure out whatever the puzzle's directions are. These can be played on ANY Kindle! On the black and white Kindles, (allow me to interject that the black and white coloring is very crisp and easy to see with the pearl ink. There are literally hundreds of shades of black, gray, etc.) you can see these puzzles very crisply. This same puzzlebook is available for the Kindle Fire in color, or you can also play them on The Cloud in color. I've played mine on my Kindle Keyboard 3G with WiFi, in the black and white, and have had no problem seeing them or solving them. These are great books to take a break from whatever you are doing, even from working, reading, or whatever you are doing as they are so refreshing to sit down and play! They are pure FUN! I like to see how many I can get correct in a row each time I play as compared to the last time I played them! What can I say? These are the BEST! Honestly, this/these are the BEST puzzlebooks I have come across! I do not think there could ever be another puzzlebook that could compare to any of these by the Grabarchuk family ever. I HIGHLY suggest you pick up a copy, or two, or three, or more so you can enjoy these just as much as I do! Here is the LINK so YOU can get YOUR copy today!